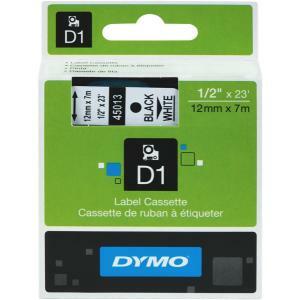 This DYMO® D1 Label Printer Tape is compatible with LabelManager™ and LabelWriter™ Duo label makers. UV- and water-resistant, it can be used for indoor or outdoor jobs. In addition, this DYMO® D1 label can easily withstand temperatures ranging from -18° to 90° C. It comes with an easy-peel backing for convenient application. Use it on plastic, paper, metal, wood and other clean, flat surfaces. Easy to remove, it does not leave behind any adhesive residue. The DYMO® black on white label printer tape is available in ready-to-use cassette for your label maker.